Finally, Today WhatsApp free voice calling Feature arrived in India officially in Android Version 2.11.561. WhatsApp Calling feature has started rolling out in India last month. WhatsApp calling was first tested in India and selected users have got WhatsApp calling Feature but many people have used various tricks to get WhatsApp calling enabled. Many have rooted their phones and then have edited Xml files etc. But now today everyone got the feature of WhatsApp calling enabled. But to get WhatsApp calling feature you have to update your WhatsApp from play store but not from WhatsApp website because in WhatsApp Website the version available is 2.11.560 for android and in Play store the new version 2.11.561 is available and this version has got the WhatsApp calling feature. See the Steps below to activate WhatsApp calling in your Android in just few minutes. First of all take the backup of your chats (Optional). WhatsApp settings > Chat Settings > Backup Conversions. Open Your Android Play Store and then type or Search for WhatsApp and Update your WhatsApp. The update file will be of 15.91 MB. After the update, go to your WhatsApp and then Check for the version. WhatsApp Settings > Help > About. And you will see that your Current WhatsApp version is 2.11.561. Now that’s it from your side, but after updating this version you will not get the WhatsApp calling User Interface (UI). Now a difficult task is for you, you have to search the person who has got WhatsApp calling feature activated, when you will find the same, tell him/her to call you. Once you received the call, Answer the call and wait for 2-3 seconds and then disconnect the call. Once the Call gets disconnected, your WhatsApp calling feature gets activated. 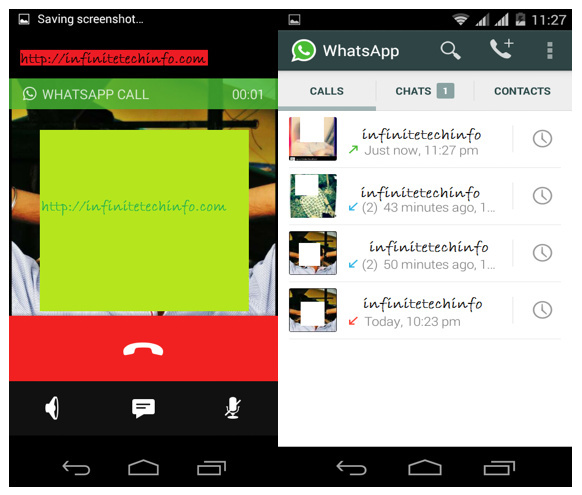 And you will get the WhatsApp calling User Interface. That’s it now enjoy and help your friends by calling them. Note : WhatsApp free voice Calling Feature Works in all Android Operating System Versions, I personally checked on Gingerbread, Jellybean, Kitkat, Lollipop and the WhatsApp calling worked fine in these Android Versions. Latest Version of WhatsApp 2.12.5 and Version 2.12.7 also Got WhatsApp Free Voice Calling Feature Today. Also Read : Lollipop Starts Rolling Out in Android One Smartphones in India. Trending : Apple Launched Fan Less Macbook with Retina Display. hii.. can u call me for whatsapp calling feature activation. Its awesome. As per your guidence its activated on my mobile. keep updating us with new stuff like this. Pls call on my whatsaap i also update but its not working!! I requested my team to call you. You will receive soon. If you received reply here. Thank you. Plse call me +919911585827 I also want to activate this feature. Please call me on +919811522500. Thank you. Hope jagan this will work for you. To activate my free call feature …. Pls anyone can do this. anyone kind enough to give me a call ? Plz call me….my Whatsapp no. Is +918793346505. .. I tried with 2.12.5, 2.12.7 force stop restart phone reboot call from friend done everything but able to receive call but not able to call. What to do. WhatsApp Calling Activation Servers are temporarily Down. Plz call me ….my Whatsapp version is 2.11.561…can anyone call on my no that is 8793346505. .I m waiting. ..can anyone solve my problem for activation of voice call feature. The servers are down at present so your whatsapp calling feature will not get activated. kindly call me on +27838602585, I have the latest version and I need to activate the calling feature too. thanks in advance. kindly call me on +27810113676, I have the latest version and I need to activate the calling feature too. thanks in advance. please help to activate, many my friends called me but not activating trying from yesterday morning. ooh, that’s very unfortunate. please update us if the system starts functioning. Is the server up now ????? Hey Sumesh, pls help me activating by calling on my whatsapp number +91 9975925137. thanks for update & support.. god bless.. I have updated my whatsApp version to 2.12.5. Can u please call me on +91 9019723064. A nice piece of info provided,thank you soo much sir. I alreay had bookmarked your site,as I am a regular visitor of this site. Can you please let me know when the servers are up. My friend called me but my app is not updated with calling feature. Dear Sir, I am using Android One Mobile (spice) i use Whatsapp 2.12.5 Version. Kitkat 4.4.4, I tried to force stop and restart my mobile. but still not activate the voice call. Can you Please help me? WhatsApp Voice Calling Servers are currenty shutted down. Once the servers are up you will get the voice calling feature activated. I’m using spice mi437 jelly bean with per-installed whats app, my whats app ver. is 2.12.14, my friend call me several times from whats app voice but its not activated. i tired to force stop whats app and restart. WhatsApp currenty have shutted down their Activation servers so once the servers are up. Your voice calling will gets activated.